Indiana finishes off its home schedule on Wednesday when it welcomes Nebraska to Assembly Hall on senior night. The Cornhuskers, who are 17-11 overall and 9-7 in the Big Ten, won the first meeting between the two teams, 60-55, on Jan. 30 in Lincoln. Senior night at Indiana is always one of the most anticipated games of the season, regardless of the opponent. Schools across the country handle the honoring of their senior classes differently, but it’s hard to argue that any tradition is better than what takes place in Bloomington. Win or lose, fans stick around almost unanimously to listen to the coach’s postgame comments as well as those of the graduating class, who are joined on Branch McCracken Court by their families. The night, obviously, is largely defined by the senior speeches which are always filled with a wide range of emotions. The proceedings last March were especially captivating given what Jordan Hulls, Christian Watford and Derek Elston went through over their four years in Bloomington. There were smiles and there were tears as those three addressed the Assembly Hall faithful and much of the same is expected on Wednesday when IU honors Will Sheehey, Taylor Wayer, Jeff Howard and Evan Gordon. But what can’t be lost in the emotion of a big evening for the program is the fact that there’s a significant game to be played before the ceremony takes center stage. Nebraska, much like Indiana, is fighting for its NCAA tournament life and this game represents a major opportunity for both teams to inch closer to 20 wins. Tim Miles has accelerated the movement up for the Nebraska program from near the bottom of the conference last season to currently being tied for fourth in the standings, which is quite an impressive feat. A big reason for that is sophomore Terran Petteway, who appears to be a lock for first team All-Big Ten in his first season in Lincoln. The 6-foot-6 Petteway is averaging 18.4 points per game in conference play with an effective field goal percentage of 49.7. No Big Ten player is using more of his team’s possessions, so that matchup is critical because Nebraska largely depends on Petteway playing well to win. 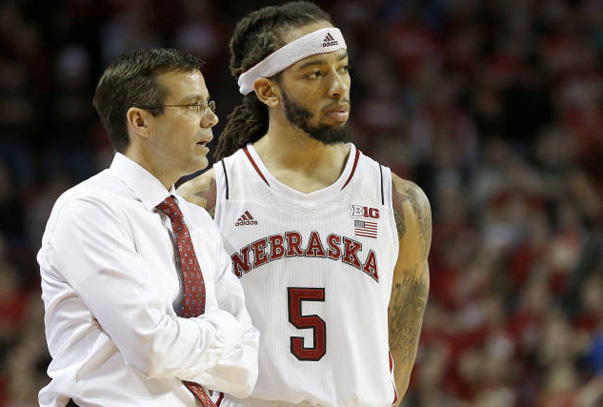 The Cornhuskers have won six of seven and in the one loss at Illinois, Petteway was just 5-of-18 from the field. It’s oversimplifying it to say that stopping Petteway results in beating Nebraska, but given that he’s 7-of-28 shooting over the team’s last two losses, it’s a good place to start. Joining Petteway in leading the Nebraska offense is sophomore Shavon Shields and redshirt sophomore Walter Pitchford, both of whom give Miles a solid nucleus to continue building his program. Shields averages 11.6 points and six rebounds in conference games, but is making just 47 percent of his 2s, which is a low mark for a 6-foot-7 player. He is, however, capable of hitting the occasional outside shot (12-of-34 in Big Ten games). Pitchford, who transferred from Florida, is 6-foot-10 but operates primarily from the perimeter. More than half of his field goal attempts in Big Ten games are from behind the 3-point line, where he’s hitting 39 percent. His turnover percentage is also remarkable at just 6.3 percent, which is fourth nationally. Junior Leslee Smith is the primary backup big man and he’s making 46 percent of his 2s in conference, but is a woeful 8-of-20 (40 percent) from the foul line. At 6-foot-8 and 255 pounds, Smith is a presence that must be marked around the basket. Freshman point guard Tai Webster continues to start, but is averaging just 2.9 points and is shooting just 26.2 percent in conference play. He’s also extremely turnover prone with a mistake on 35.3 percent of his possessions, which is second-worst in the Big Ten at any position. Senior Ray Gallegos has been in and out of the starting lineup and has also struggled to shoot (43 eFG%) in league play. Sophomore Benny Parker also sees close to 14 minutes per night as a backup point guard and is hitting 46.4 percent of his 2s to go along with a steal percentage of 4. Junior forward David Rivers has started five Big Ten games. Like most of the Nebraska players outside of Shields and Petteway, he’s limited offensively (3 ppg in 18.8 minutes). Nebraska is built on defense as the Cornhuskers are surrendering just .99 points per possession, the second best mark in Big Ten play. Offensively, this team has its challenges as no player outside of Petteway, Shields and Pitchford averages more than 5.8 points in conference play. If you look at the Big Ten’s top three defenses — Ohio State, Nebraska and Illinois — all three have challenges offensively and the Hoosiers have already beaten two of them at home. Both teams struggle with turnovers and get to the line at a decent rate, but Indiana is the superior shooting team from distance and the foul line and hits the offensive glass much harder. The Hoosiers beat Ohio State despite not having an advantage on turnovers or the offensive glass because the Buckeyes couldn’t make a perimeter shot, but a similar performance against Nebraska is unlikely to yield favorable results. Senior night in Assembly Hall is a date that fans circle on the calendar when the schedule arrives in the fall and Wednesday’s game is no different as it’s the send off for Sheehey and the other seniors and a game with major Big Ten and potentially NCAA tournament ramifications. Nebraska has been very shaky away from Pinnacle Bank Arena with a 2-6 mark in conference road games. The two wins came at Northwestern and at Michigan State, which has now dropped four of six. The Vegas line opened with Indiana as a five-point favorite and Pomeroy likes the Hoosiers to win by four, with a 65 percent chance of victory. The Sagarin Ratings like IU by 5.5. If Indiana is to continue its surge to make a play for an at-large bid, this is quite simply a must win. Sic Will on Peteway and see what happens. IU can’t play any worse three pt defense than they did in the second half at NEB. I’m kind of feelin’ a blowout too. We are coming on strong now. Kind of like they now realize what they have to do. Wish they would have done it 3 weeks ago though. I’ll always be wary of predicting a blow out in the Big Ten, but the team has just looked different these last 2 games. I thought they would get to this point earlier in the season, but as of right now, I don’t think anyone in the league is playing better than IU. We win two games in a row and fans start predicting blowouts! I like it. Yep. IU owes them one after the last two years out there. Hoosiers are playing better ball and its senior night. I don’t think Will goes out with a dud like last years group. Got the makins of a perfect storm. And Taylor Wayer scores 5 points . Hows that? Nice photo ITH. We got ya numba Petteway. Clinging to my optimism. Plus, I think Will isn’t done just yet. Don’t believe in calling things like this….LOL! IU should always play strong defense, even if shooting is not great. Have to keep those turnovers to a minimum also. I really hope they beat Nebraska. If we get swept by them this year, I won’t be able to sleep at night! JEFF HOWARD GOES FOR 30!! I heard the over/under on the amount of words in Will Sheehy’s Senior Night speech is set at twelve and a half. I expect Petteway to not be very good looking. Yes yes I’m a punk I know I know. What to expect? Well, that is the question, isn’t it? Yeah but does that include words that have to be bleeped out for radio or TV broadcasts? Let it fly Will!!!! I like it. IU was up 13 at half at Nebraska. It would be nice for them to blow them out tonight. I am optimistically expecting IU to play well and win by 8-10 but I just don’t know. This has been a roller coaster season and I don’t expect the head scratching performances around the Big Ten to stop now….come on Hoosiers let’s keep those tourney hopes alive! All 4 seniors starting alongside NV. no doubt…what kind of preview ..makes no mention of the most talented guy in the game? thanks for the work you guys do …but no mention of Noah’s status.. wtf?